The next time you're mountain biking in the Whiteface Region, consider this: Those winding paths, with their heart-rate-increasing obstacles and gentle dips and turns, were all constructed by hand. 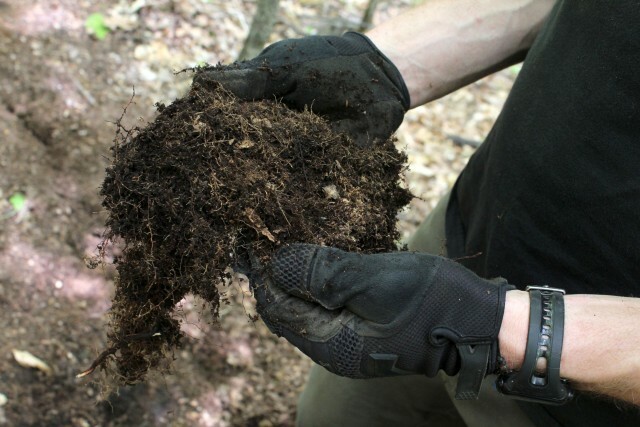 Imagine moving half-buried boulders with a steel pole, or building berms with a pick and shovel, and you'll start to get the idea. Josh Wilson calls it fun — it's rewarding work — but he's also the type to embrace a challenge. Josh is the executive director of Bark Eater Trail Alliance, and he's helped make some of the region's best mountain bike trail networks go from the dreaming phase to reality. In Wilmington, there are the Hardy Road Trails, Wilmington Flume Trails, and Poorman's Downhill. In neighboring communities, there are even more, including Craigwood and Logger Loop in Lake Placid and Mount Pisgah Flow Trails in Saranac Lake. I met Josh at the Wilmington Flume parking area on Route 86. It was a warm morning, the kind that hints at afternoon showers, and we walked along the Marble Mountain Trail to get to the site of the future Ridge Connector Trail. Josh laughed as we left the parking lot because the stack of lumber in the back of his pickup truck would later be carried up the mile-long path we were on. 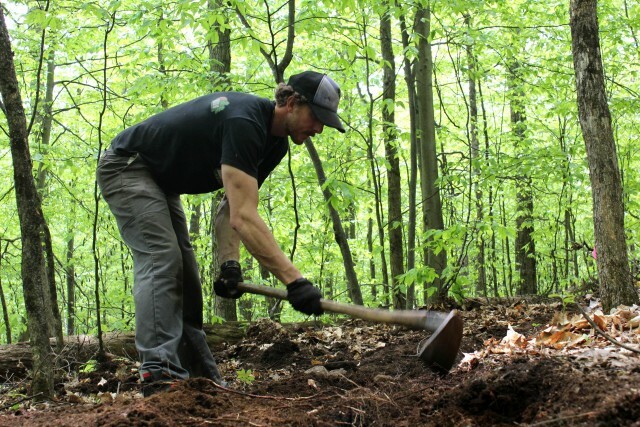 Even with its paid trail crew, BETA relies heavily on volunteers and other organizations to build and maintain the mountain biking trails. 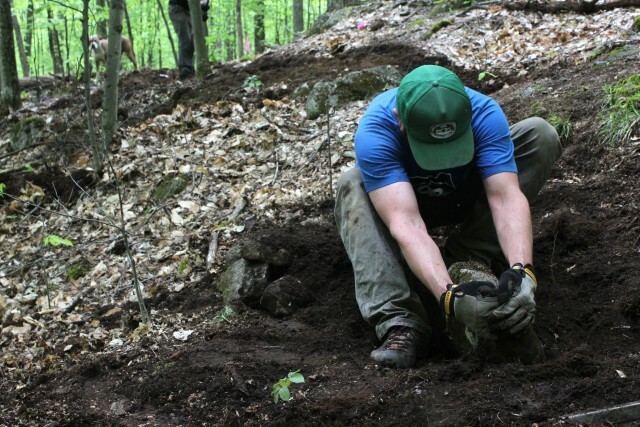 "The reason this is successful and continues to be is the partnership between the town, the DEC, the local volunteers, and groups like BETA and the Adirondack Mountain Club, who are all really involved in the trail building," Josh said. "If it was just a small group of volunteers, and there wasn't all the buy in from the businesses and all of these groups, there's no way this much work would get done." As we climbed the gentle grade up the Wilmington Range's lower flanks, Josh talked about trail design. Some paths simply follow an old dirt road, but many are first-time cuts through the trees. Trail engineers walk the proposed route and use orange flags to mark it, making it easier to see how it moves around trees and other natural obstacles. After the route is settled, the path is raked and the soft, top layer of duff is removed. Depending on how difficult the trail will be, large rocks can be excavated and moved to aid in things like stream crossings. 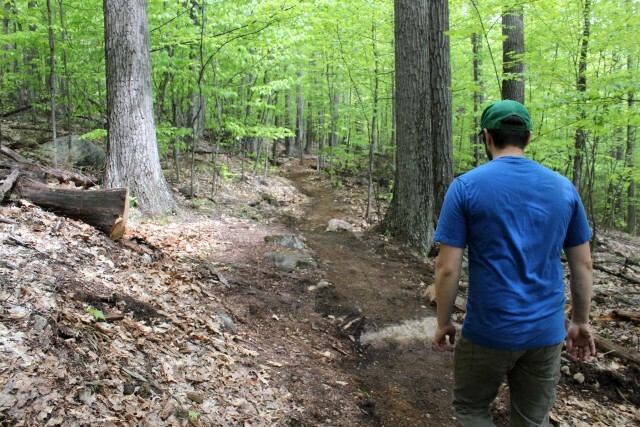 A few new trails are going in this summer. The most exciting is a 2-mile connector to link the Flume trail system to the reservoir trailhead, which makes the trails accessible from downtown Wilmington. Josh said local business owners are embracing mountain biker traffic, and he stressed the fact that the trails are designed to appeal to all skill levels. There's no need to feel intimidated by mountain biking — there are plenty of beginner trails to test the tread on, and you won't have to go far to find more challenging terrain once you get better. Check out the trail stats below, then scroll a little further for some of Josh's recommendations. Josh stressed that easy trails aren't necessarily wider. While some of them follow old woods roads, making a naturally wide path, many are singletrack, which is generally about 18 inches wide. If it's a beginner trail, the terrain will be relatively flat and over smooth terrain. This is mountain biking so it won't be like riding on pavement, but most major obstacles, like large rocks, have been removed. "Mountain biking is designed to be practiced on a natural surface — dirt — and on singletrack trails that aren't highly engineered," Josh said. Flume and Hardy Road are both set up with the easier trails closer to the road, so if you ride from the parking lot at either system you'll be on some sort of beginner or intermediate trail. "At the Flume there are the Delta and Bluff trails, and the River Loop, which goes along the river," Josh said. "You can get a fun ride without committing to a long day in the woods. The Cedar Trail at the Flume is also a good beginner or intermediate trail. At Hardy Road, on the parking lot side there's Coniferous and a new trail we built called the lost farm Loop. Those are probably the two easiest at Hardy." On the other side of the road at the Hardy Road Trails, things get progressively more difficult as you ride away from the road. "You can stay on the lower stuff, like Twisted Pine, Double Track, and Make Believe," Josh said. "Some of those might have a little stiff climbing, but overall the trail itself is pretty easy. It's smooth and fast." Josh said at Hardy Road, the All In Trail is probably the most popular. It has an 800-foot vertical climb with two different options for descending a nice, long downhill. On the other side, the Good Luck Trail is a sort of rocky, technical, expert-level singletrack. Go there for things like rock features and rock gardens. "With the Flume you have the same kind of thing, where the trails get harder as you move up the mountain," Josh said. 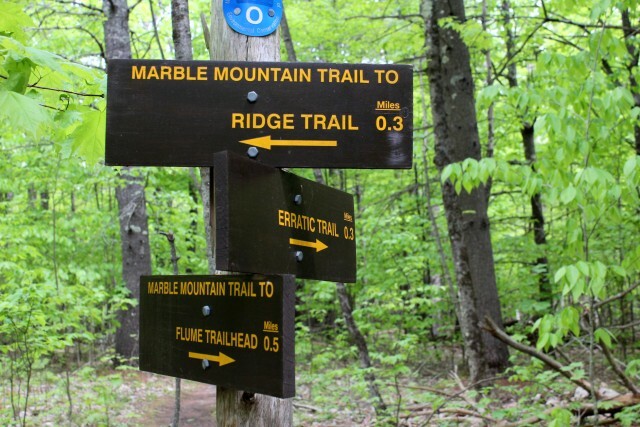 "The Ridge and Marble Mountain trails are the long, more technical, expert level trails. There are others near the parking area, like the Rock Garden, if you really want to try something difficult." And it turns out, a rock garden is exactly what it sounds like. "A rock garden is anything where you have a whole trail or a section of a trail where there's a lot of stone sort of all jumbled together in the singletrack," Josh said. "What makes them challenging is you have to find the best line between them as you go." You'll find lots of bike-friendly restaurants and lodging in the Whiteface Region. Spend a weekend exploring our trails!